Godfrey Nims was my 8th great grandfather. The first record mentioning him appeared in a Springfield, Massachusetts court record on September 24, 1667, whereby he and two other boys, James Bennet and Benoni Stebbins, were convicted of breaking into Robert Bartlett’s house while Mr. Bartlett was church and stealing “24 shillings in silver and 7s in Wampum with the intention to run away to the ffrench”. The youth confessed their wickedness and were sentenced to being whipped on their naked bodies, as well as paying Mr. Bartlett back 3 times the amount of what was stolen. Evidently Godfrey straighted up, and set about becoming a respectable citizen of the town of Deerfield, Massachusetts. He married 10 years later, and had six children with his first wife, widow Mary Miller. Following her death, he married Mehitable Smead Hull, with whom he had 6 more children. Each of his wives had also brought two stepchildren to the marriages. Godfrey provided for his wife and 15 children by working as a farmer and a shoemaker. In 1694, shortly after his marriage to Mehitable, one of her sons died when their house caught fire. One of the other children accidentally set fire to the flax bed they were sleeping in with a lit candle. Godfrey soon rebuilt his home on the same site. In 1697, his three year old son, Thomas, died. In 1703, his son John Nims and stepson Zebediah Williams were captured by Indians and taken captive to Canada. 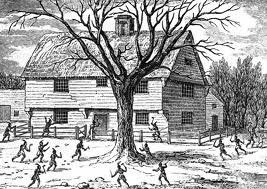 Then the following year, during the night of February 29, 1704, nearly 300 Mohawk and Huron warriors and 48 French troops attacked and burned the town of Deerfield, Massachusetts. Many of the townspeople were killed in their sleep, burned in their homes, or otherwise murdered. Over 112 men women and children were taken captive and marched 300 miles to Canada. Those who could not keep up the grueling pace despite the horrific conditions, were killed. Nothing paints the sad picture better than these words from “The Story of Godfrey Nims”..
“When the flame-lit night of February 29th, 1704, gave place to the cold dawn of March first; and Godfrey Nims, standing here, looked upon what had been his own hard-won home and was then the smoking funeral pyre of his three little daughters, there was left to comfort him but one member of his family. Another sad story from this event was that of Godfrey Nims’ eldest daughter, Mary Williams. She along with her husband and two young children were some of those captured in the raid. On the 8th day of the forced march, Mary spoke to her minister, also captive, telling him she had been “disabled by a fall on the ice, causing a miscarriage during the night. I will not be able to travel far, and I know they will kill me today. Pray for me that God would take me to Himself.” It is said that they then parted and she went calmly to her certain death on March 7, 1704. In total, his wife and 10 of his children and stepchildren were either killed in the raid, died on the march, or never returned. Godfrey himself died the following year. Godfrey Nims was my 8th great grandfather. His aptly named daughter that survived the raid, Thankful, was my 7th great grandmother. 1. Sheldon, George, A history of Deerfield, Massachusetts: the times when and the people by whom it was settled, unsettled and resettled, (Deerfield, Mass. : unknown, 1895-1896, 1414 pgs. ), V2. 2. Thompson, Francis Nims, The Story of Godfrey Nims as read to The Nims Family Association at Deerfield, Massachusetts, on August 13, 1914, (unknown: unknown 19 pages). My goodness Tami! This story sounds like it should be a whole book all by itself. That is truly a sad and horrific tale. We really should be grateful to live in the times we do. What a miracle that your 7th g-grandmother survived! Thank you for sharing this story. My ancestor was James Bennett (1652-1676) who I believe is the James arrested with your Godfrey. James married Mary Broughton, whose second husband was Benoni Stebbins (1655-1704). Benoni perished during the Deerfield raid. I descend from James & Mary's daughter, Mary who married John Field. One book that I found interesting was “Captors and captives: The 1704 raid on Deerfield” by Evan Haefeli & Kevin Sweeney. Hi Travis! Thank you so much for that. Sounds like a fascinating read. I know that there is so much more information available on the captives — some that were rescued later, some that escaped and others that chose to stay with the Indians. The whole story is fascinating and I am going to look for that book. WOW! What a story to unveil & share! Thanks for sharing… love reading your stories! You have a great blog, look forward to reading more of your posts. I'm a Nims, growing up my father would tell us about Godfrey and the massacre, I'm now based in MA and have been to Deerfield several times, it was very interesting!